A mecca for extreme snowsports enthusiasts, Chamonix is France’s oldest ski resort, holding the first Winter Olympics back in 1924. The ski resort encompasses four different areas over 4 mountains – Grands Montets, Balme-Tour-Vallorcine, Brevent-Flegere and Les Houches. With only an hour transfer from Geneva, it is a very popular destination for short breaks. But its separate ski areas are mainly interlinked by public transport so it does require some planning and bus hopping to ski its terrain. The Mont Blanc Unlimited lift pass not only gives you access to all areas in the Chamonix valley, but also a day in Verbier, Courmayeur and Megève. Although Chamonix has a reputation for its challenging skiing, it also offers gentle slopes that are great for intermediates and beginners. Beginners should head to Balme le Tour for gentle slopes after graduating from the nursery slopes at village level. Les Houches is also good for intermediates with long tree lined runs with views of the Mont Blanc chain and also home to the Le Kandahar World Cup ski race. Intermediates should also go to Brevent-Flegere has sunny gullies and is the only lift linked resorts in the Chamonix area. For long and challenging runs seeing vertical drops and descents up to 2,100m, Les Grands Montets is the place to go. The cable car up allows access to the glacier, known for snow quality and coverage all season round and reaches a summit of 3,295m. For off piste skiing, go up to the top by the Aiguille du Midi. This is expert-only territory with no marked pistes but anyone can enjoy lunch at the Restaurant Le 3842 and take in the views of the Mont Blanc Massif, the Mer de Glace and Chamonix valley. We recommend having a mountain guide to get around the mountain and in particular if you are looking to ski off piste terrain. The Vallée Blanche has a long standing reputation amongst skiers, starting at the top of the Aiguille Midi. It’s an unmaintained and unpisted route descending 22km all the way back to Chamonix, so having guide is the safest way to tackle this run, as you’ll need a rope at the start of run when walking across the arête. Best for beginners and intermediates with 7 reds and 11 blue runs, whilst at the back of the Le Tour there is superb off-piste opportunities that are great for snowboarders. Wooded, steeper runs can be found on the Tete de Balme’s north side. Les Houches can be seen as the beginner’s area of Chamonix, but it does have some long, steep runs such as the black run ‘Verte’, home to the Kandahar World Downhill Ski Championships. The blue Aillouds is a beautiful tree lined run, perfect for a nice long cruise down a 9km descent. Be sure to stop off and have a break or some lunch at one of the cafes and restaurants amongst the tree line. The Charles Bozon run at the top of the Brevent cable car is a great one for experienced skiers. Its high altitude also means its snow conditions are excellent as it’s non-pisted, making it an ideal run to practice your carving techniques. 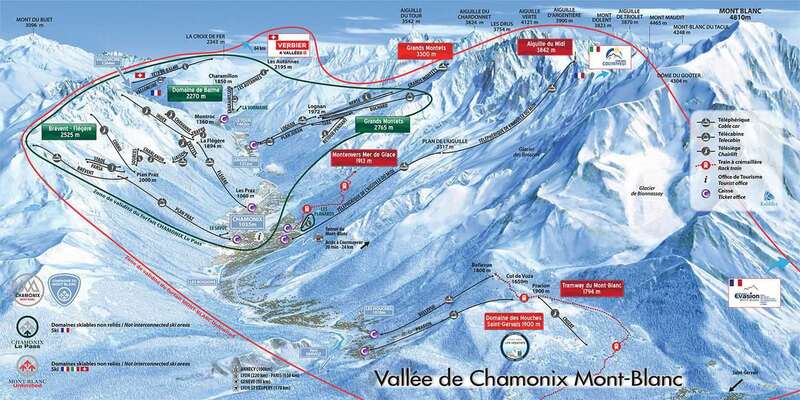 Despite its low altitude at 1035m, 90% of the ski area is located above 2000m, making Chamonix a snow-sure resort. If you prefer walking or snowshoeing, then ski holidays in Chamonix have just what you need to enjoy high mountain scenery: discover the Mer de Glace with the picturesque cog railway of Montenvers, take Europe's highest cablecar to the top of the Aiguille du Midi, ride on the Tramway du Mont-Blanc, France's highest cog railway, fly over the Mont-Blanc range with Chamonix Mont-Blanc Helicopters - or simply enjoy the 17 km of footpaths which take you deep into the winter landscape. For a change of scenery, the Chamonix Bus Company offers day trips to beautiful nearby cities such as Annecy, Geneva (Switzerland) and Aosta (Italy). There is also a wide selection of traditional cafés and tempting pastry shops along with 14 bars, 80 restaurants, 100 shops and 7 discotheques. The world-class casino in the centre of town will tempt the gambler in you with black jack, roulette and slot machines of the purest tradition. The Vox Cinema delights movie goers with all the latest films - and frequently in the original version. The centre of Chamonix is a pedestrian-only area and there is a good choice of interesting shops and galleries to explore. On bad weather days, wander along the River Arve and stop off for a hot chocolate at one of the cafes or pay a visit to the Alpine Museum to learn more about the area. There is a swimming pool at the sports centre along with a sauna, jacuzzi and steam room and an Olympic-sized covered ice rink here. 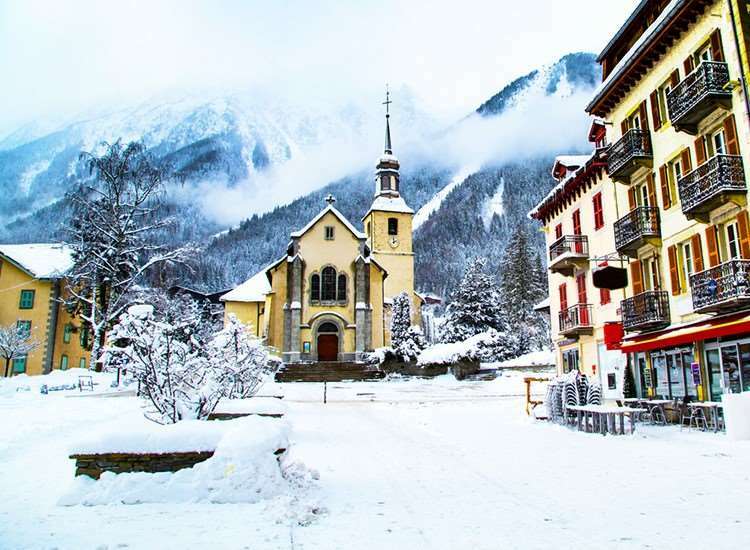 Chamonix is not lacking in upmarket shops and good restaurants, such as Albert Premier with its two Michelin stars. For a more reasonable meal, head to La Maison Carrier (sister restaurant to Albert Premier) with in a lovely rustic chalet for fantastic regional dishes and views of Mont Blanc. MBC is a great microbrewery and restaurant for a fun evening out with live music on some evenings and a selection of ales and lagers brewed directly behind the bar. The staff are really nice. The hotel has the best location. The most exciting Vallée in the world. So much great skiing and adventure. Most people neglect the ski areas of Brevent and Flegere right in town and go to the ski mecca of Grand Montets up the road in Argentiere but they are missing some of the best stuff. This is one ski area you will never be bored in. Authentic, exciting, lively, and best of all, challenging !